← Shortest Arctic Melt Season On Record? 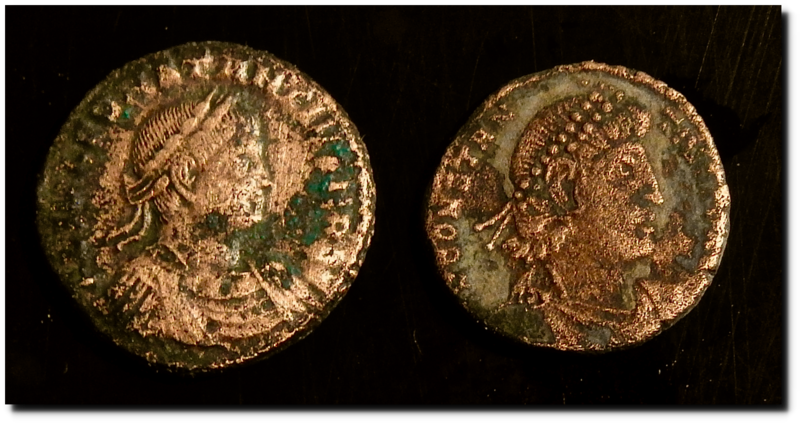 Roman soldiers would frequently bury their coins before they went off to war. Many never returned or couldn’t remember where their 0% interest bank was. People with metal detectors find these stashes after 2,000 years of oxidation and sell them on E-Bay. I bought a stash of these from Croatia, and am finding some gems down underneath all the dirt and rust. One common design on the tail side, was very similar to that on the back of the 1959 British threepence. 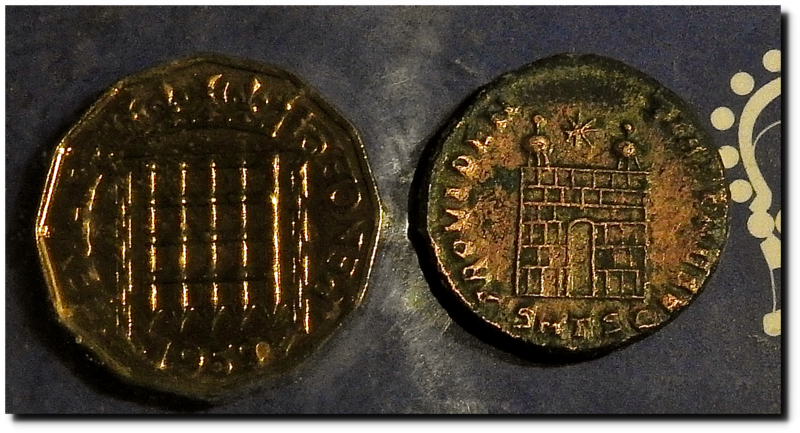 The threepence has a portcullis whereas the other coin looks like a tower. I was a coin geek, when I was a kid. Cheers, Tony. Have any idea what the material is…maybe bronze? One was originally the badge of Henry VII, the other is a Roman castle camp-gate with two turrets (Constantine I the Great 307-337 AD Bronze follis – says Google). In 50 years time UK coins will have an Islamic Mosque instead of the Portcullis, and still look similar. I’m pleased you are enjoying these – but the threepence is showing a portcullis, something not invented in Roman times, afaik, – the design is surely a city gateway on the roman coin? And the gold and silver coins have not lost their monetary worth. This type of AE4 with camp gate reverse was struck during the reigns of Constantine I and his sons Crispus, Constantine II, Constans, and Constantius II. The camp gate device alluded to the strength of the Roman army and the protection it afforded the Roman people against attack by foreign invaders. yes. the threepenny bit has a portcullis, which was a metal trellised gate that was opened vertically. Usually on the other end of a drawbridge. from a military point of view, both combined were deadly. If you saw danger, gravity would close the gate in a second. You could shoot through the gate at people you didn’t like. Once you were holed up, the gate could be opened slowly, then the drawbridge dropped in a second so your fast attackers could rush out and do the dirty on people you didn’t like.